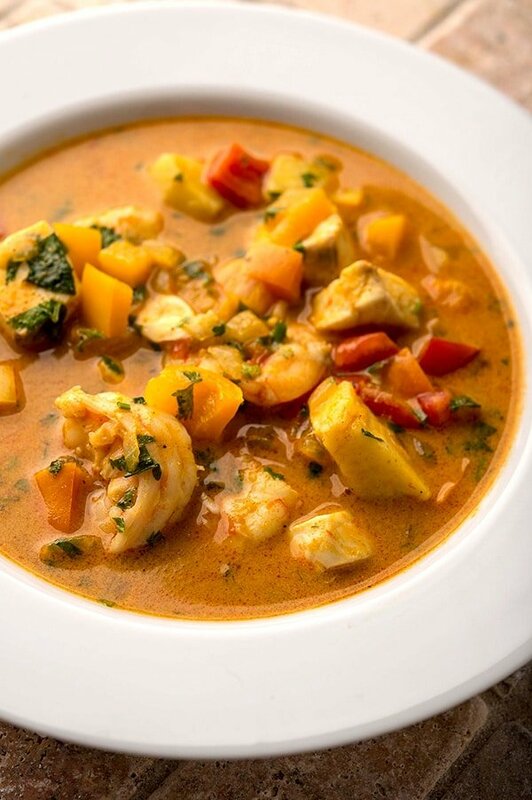 If you’re looking for a fun, bright and tasty fish stew, you’re in the right place. There’s something about tropical food that’s just exciting — vivid colors, summertime ingredients, exotic flavors, and a constant balance of sweet-salty-sour-spicy that makes you want to eat more then you really ought to. But when you try to cook it yourself, too often you get hung up on hard-to-find ingredients. And while I use a couple here, there are easy substitutions available in any supermarket that make this stew accessible anywhere. 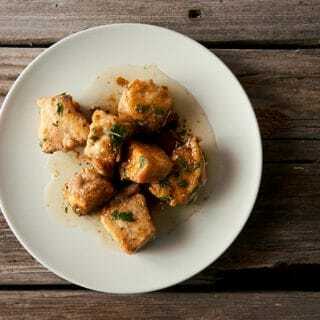 What is an “African fish stew” anyway? After all, Africa is a big place, far larger than the United States, made up of countless cultures. Well, this dish takes its inspiration from the Swahili Coast in East Africa, where it’s hot, there are lots of fish, and there is a significant Indian influence on the cuisine. You could easily find something like this stew anywhere from Mozambique to Kenya, a 2500-mile stretch that covers most of Africa’s east coast. 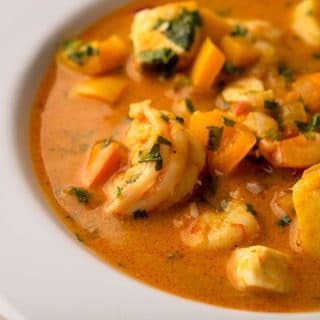 The recipe relies on vegetables, fish and shrimp or crab, coconut milk, and a bit of curry powder. You can buy curry powder in pretty much any supermarket in America, and canned coconut milk isn’t much harder to find. What’s more, coconut water — the water inside a coconut you see people drinking on desert islands — has become some sort of fitness fad and cartons of it are popping up all over in markets. If you can find coconut water, you can use it in this stew in place of regular water to add one more layer of flavor. Other than that, this stew is super easy to make: Onions, sweet peppers, potatoes, some tomato, a few chiles, any fish you want, some shrimp or crab, and cilantro for garnish. Easy-peasy. I like to make a quick fish broth for the stew using the heads and bones from the fish I just caught, but you can skip that if you don’t want to bother. I have instructions for the broth here. What fish to use? I used striped bass, but pretty much any fish you can think of would be fine. In general I’d aim for a white, lean fish — wallleye, perch, bass, catfish, snapper, rockfish, grouper, cod or haddock, etc., etc. — but you could do this with tuna, or salmon, or a warm water fish like Spanish or king mackerel or wahoo. You get the point. 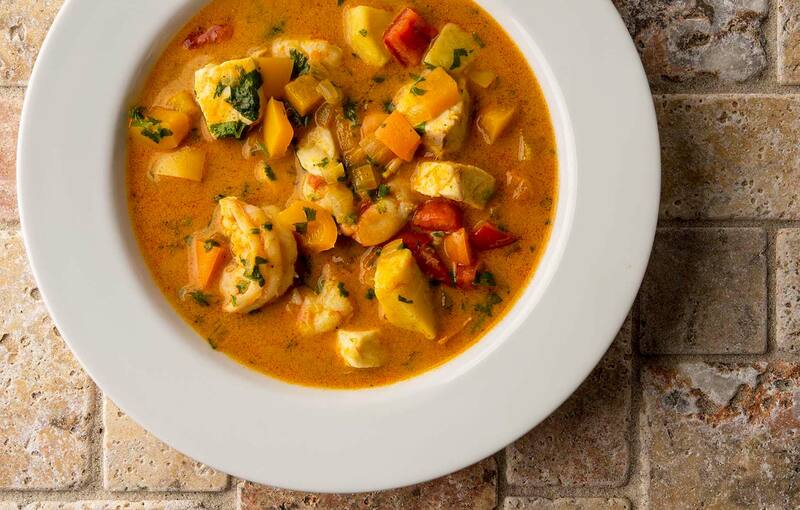 I serve this fish stew alongside coconut rice: Medium- or long-grain rice cooked in coconut water and a little coconut milk (3 tablespoons per 1 cup of uncooked rice). But regular rice, or even just bread would be fine. Use any firm fish here, and whatever shrimp or crab you have available. I like making a fish stock from the heads and bones of the fish I am using, but you can skip that and use chicken stock instead, or even water. Use coconut water for the water in the stew if you can get it, otherwise just skip it. Serve this fish stew with rice. In a large, heavy pot like a Dutch oven, heat the oil over medium-high heat and saute the onions until soft, but not browned. Add the tomato sauce, curry powder and potatoes and stir well. Pour in about 6 cups of the broth you just made, or chicken stock. Bring to a simmer and taste for salt. Simmer gently until the potatoes are almost tender, about 20 minutes. Add the sweet peppers, the chiles, the diced tomato and the coconut milk. Stir well and simmer gently for 10 minutes. Add the fish and shrimp and simmer until the shrimp are nice and pink, about 5 to 10 minutes. Add the cilantro, cook another minute, then serve. You can find more than 100 recipes for fish and seafood right here on Hunter Angler Gardener Cook! We just made this tonight and it was a lot milder than 2 habeneros would lead one to believe. We really loved it tho and will probably keep the recipe in our dinner rotation.